EA Sports has just released the demo version of FIFA 13, the most popular football gaming series. At the moment FIFA owns nearly 70-75% of the market share when it comes to footballing games leaving Konami’s PES (Pro Evolution Soccer) a long way behind. The demo version can be downloaded on PC, PS3 and Xbox. It’s obvious that the demo version won’t have all the features that will be present in the full version, but to judge the gameplay, graphics, commentary, etc this demo version is pretty much enough. The main features included in FIFA 13 demo version are 1st touch control, attacking intelligence & complete dribbling. FIFA 12 came up with a superb feature called tactical defending, so I’m assuming that it will be retained in FIFA 13 demo. In the demo version only selected teams like AC Milan, Arsenal, Borussia Dortmund, Juventus & Manchester City. Although only one stadium i.e. the Etihad stadium (home of Manchester City) is included in it. As per the official page, Match Day & Skill games are two options that will be included in FIFA 13 demo. 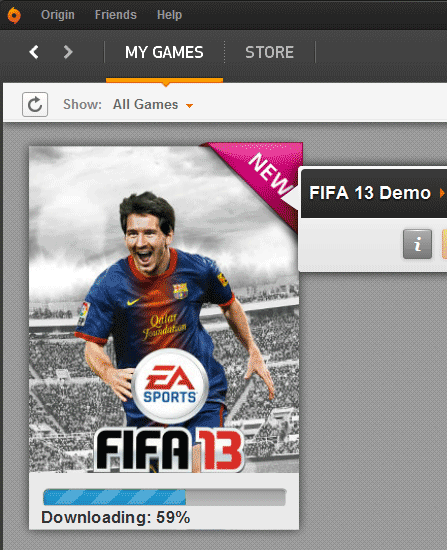 Downloading FIFA 13 Demo for pc is not as straight-forward as it is with other platforms like PS3 & Xbox. There is no direct download link for the game and we’ve to install an official EA Sports downloader called Origin Client to download the game. To download FIFA 13 demo for PC, go here first. On the top, you’ll see a ‘Download Origin‘ button. Download and install the Origin Client first using the installer. Open the application, navigate to the Free Games tab and you’ll find FIFA 13 demo. Click the ‘Get It Now‘ button and download the game. Your game will start downloading right away. The progress bar is an indicator, but there is no ETA as such. So just hope it gets downloaded quickly on your hard drive. FIFA 13 demo’s size is around 2 GB, do free some space beforehand. FIFA 13 Full version release date – 25th September 2012. Pre-Order FIFA 13 from FlipKart for 1499₹. So I hope this tutorial helped you in downloading FIFA 13 demo for PC. I have purposely left out the steps for PS3 & Xbox as I haven’t tried them, but you can find the links here – PS3, Xbox. I’m very excited to try the demo version out, FIFA does give us gamers plenty of joys in life. You can go to ea.com or origin.com and register an account for free. I remember my cousins like playing FIFA, but I’m not sure if they have already this FIFA 13 yet, so I’ll let them know about the free demo download. Thanks for sharing, Mani.